Product #20692 | SKU 1065-005-110 | 0.0 (no ratings yet) Thanks for your rating! 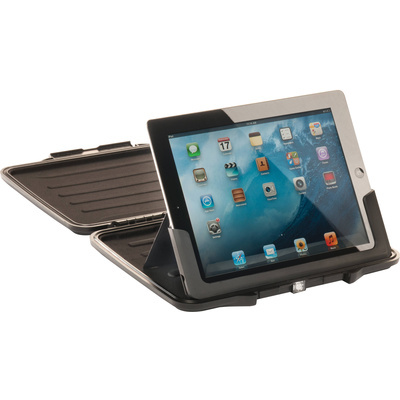 The black Pelican ProGear i1065 HardBack Case (with iPad insert) for iPad 2nd, 3rd, 4th Gen is a rugged case designed to protect your tablet from a variety of contaminants. It's watertight, crush proof, and dust proof. A moulded liner cushions against impacts and ensures your tablet won't get scratched while it's inside the case. Meanwhile the integrated easel allows you to prop up your iPad for hands-free viewing.